LALO GUERRERO was born in Tucson, Arizona on a cold Christmas Eve in 1916. An early love for music would take him far, learning to play the guitar when he was just nine years old. His mother was his first and only music teacher. Guerrero became internationally recognized as the “Father of Chicano Music” in a career that spanned generations. He was a great entertainer and he took his guitar and music everywhere – the White House, a neighbor’s house, a concert hall or a classroom. It was all the same to him. Lalo wanted to make people happy and his hermanos/brothers proud of their Mexican heritage. Doing just that, he became the musical historian of his beloved Chicano culture. His honors were many including an NEA National Heritage Fellowship (1991), National Folk Treasure, Smithsonian Institution (1980), Tejano Music Hall of Fame (1992), California Hispanic Chamber of Commerce President’s Award (1996), the Alma Award (1998) and invitations to the Jimmy Carter and George Bush White House. 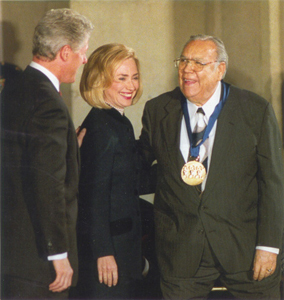 In 1997, President Bill Clinton presented the troubadour with the National Medal of Arts, the first Chicano ever to receive our nation’s highest arts award. 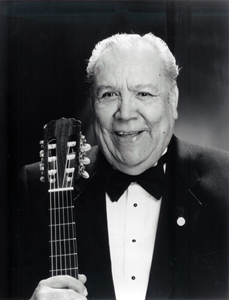 Guerrero continued to entertain to standing ovations only months before his guitar was silenced on March 17, 2005 at the age of eighty-eight.